The story of Robert Cloud. A compilation of all known recordings by this obscure composer, arranger, and musician. Liner notes by noted Canadian jazz writer Mark Miller contain original research used to piece together a biography of this shadowy figure. Rare and unusual recordings by the Ross De Luxe Syncopaters, Jacksonville Harmony Trio, QRS Boys, Rollin Smith, Robert Cloud Orch., Georgia Jumpers and the Grand Central Red Cap Quartet. Alonzo Ross-p-v dir. Melvin Herbert-t/Robert “Cookie” Mason-t-v/Eddie Cooper-tb/Robert Cloud-reeds-arr/Earl Evans-Edmond Hall-reeds/Casker Towie-bjo-2nd p (as noted)-v/Richard Fulbright-bb/Frank A. Houston-d-v/Margaret Miller-v.
1. Victor 21537 is credited to Rose de Luxe Syncopaters. 2. Monia is also known as You Gotta Know How To Love. 3. Believe Me, Dear is also known as The World Is Waiting For The Sunrise. Charles Frazier (tenor voice)-Lester Pratt (baritone voice) accompanied by Sugar Underwood-p.
1. 39832-1 is credited to Charles Frazier (of the Jacksonville Harmony Trio), Tenor. 2. 39833-2 is credited to Lester Pratt (of the Jacksonville Harmony Trio), Baritone. ?Robert Cloud-ts/Walter “Fats” Pichon-p-v-sp/Benny Nawahi-stg/unknown-v-sp. Note: QRS R-7062 as Q R S Boys (Fat Pinchon At Piano). Rollin Smith-v acc. 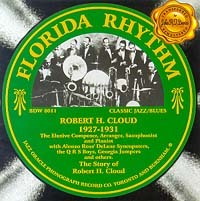 by Robert Cloud and His Orchestra: 2t/tb/Robert Cloud-as-ts/2 other reeds/vln/p/bjo/sb. The CBS files show Rollin Smith as vocalist on this master, but aurally this is not the case. The CBS files show the composers as “Harrison-White”. 2t/tb/Robert Cloud-as-ts/2 other reeds/vln/p/bjo/bb/Herman Tapp-v.
Benny Nawahi-stg-u dir. ?Robert Cloud-cl-as-ts/k/?Bruce Hinkson-vln-pic/?Wesley Wilson-p/g/v.
? Rollin Smith-____Garrison-?William Robinson-another-v accompanied by Robert Cloud-p.